There will be a Q&A after the presentation. To register, call 330-688-3295 ext. 4 or visit http://www.smfpl.org This program is cosponsored by the Stow-Munroe Falls Public Library and the Friends of the library. Common pitfalls in writing a novel and marketing your book from the first line. Laura Freeman has been a reporter for more than 11 years and covers the historic town of Hudson, Ohio. She has won the Press Club of Cleveland’s Ohio Excellence in Journalism award twice and the Ohio Newspaper Association award several times. Laura grew up in Stow, Ohio and graduated from Kent State University with a degree in communications/journalism. 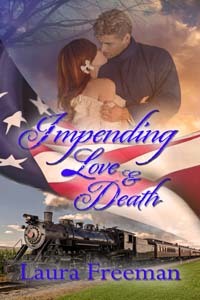 The Wild Rose Press has published two of her novels, “Impending Love and War” is about the conflict of abolitionists and slave chasers which takes place in 1860 in the fictional town of Darrow Falls, Ohio and “Impending Love and Death” which is about the journey of Jem Collins to Washington City and Richmond in search of her missing husband after the battle of Bull Run. Living in Alaska for 27 years, Devon McKay has many exciting stories to tell about the state. On several occasions, she was chased by a mother moose defending her young, stalked by a bear, endured temperatures of forty below and once was even trapped in an avalanche. She loved every minute of it! After writing her first novel, “Cowboy On The Run,” she now calls a small ranch in Ohio home with her loving husband and teenage son. Although the farm life is slightly more laid back then the perils of Alaska, Devon enjoys the slower pace of the country lifestyle which gives her plenty of time to follow her passion of writing. Kathy Otten is the published author of numerous novels and short stories. She writes primarily historical romance, but has also been published in historical fiction, and contemporary romance. She is currently working on a young adult novel as well as a Civil War romance. Kathy teaches fiction writing at the Corry Hi-Ed Center in Corry, PA and has presented workshops on line and at area writing events. Kathy is the mother of three grown children and one grandchild. She lives in the open farm country of western New Yok with her husband of 33 years. She enjoys taking long walks with her German Shepherd Max, through the fields and woods near her home. In the winter she likes to curl up with a good book and one or two of her three cats, while the snow blows outside. In between family, work and animals she can be found at her computer weaving stories of laughter, heartache, and love for the crazy cast of characters swirling around in her head. A 1950s-60s science-fiction fanatic and rabid reader as far back as she can remember (which is very far), Sandy Wickersham-McWhorter is a native of Muncie, Indiana, who has been stuck in Ohio since she married in the Air Force in 1973. That science fiction and odd dreams led to a bite from the writing bug in 1990 and stints at three local newspapers while learning the writing craft, writing her first novel, all while earning a BA in English at Ohio State University. A desire to return to her nonfiction roots led to an MFA in creative nonfiction from Ashland University in 2013. Currently, she’s working on a new sci-fi novel which finaled in Lori Wilde’s “Drive Em Wild” contest and her memoir, Feral Child: An Oblivious Life. Visit her website at www.sandywick.com.